It’s not flashy, but the Subaru Forester has the second-lowest price for a compact SUV with traction-improving all-wheel drive. This year, it adds new safety and entertainment features that connect drivers with emergency services and link more easily to mobile apps. The Forester dashboard also has new, larger touchscreen displays that make them easier to use. None of the updates, however, detracts from Subaru’s simple and functional approach for the eminently practical, five-seat Forester. And fuel economy rated at 24 mpg in city driving and 32 mpg on highways makes the Forester eighth-best among gasoline-powered, non-hybrid 2016 compact SUVs. Forester fans find the nicely sized, five-door SUV, which dates to 1998, to be a good value — so much so it continues to rank as Subaru’s best-seller in the U.S. The 2016 Forester earned five out of five stars in federal government crash tests and is a recommended buy of Consumer Reports, which predicts its reliability will be better than average. The Forester also topped other compact SUVs in resale value, according to residual value expert ALG. Subaru makes all-wheel drive standard on every Forester. The feature can improve a vehicle’s traction in wet and snowy conditions by detecting when wheels begin to slip and sending power to wheels that still have traction. The starting manufacturer’s suggested retail price, including destination charge, is just $23,245 for a 2016 Forester 2.5i with the base 170-horsepower, non-turbocharged four-cylinder engine, manual transmission and all-wheel drive. This price is second only to the smaller and less powerful 2016 Subaru XV Crosstrek with all-wheel drive, which starts at $22,445. The starting retail price for a 2016 Forester with all-wheel drive and the fuel-optimizing continuously variable transmission (CVT) that a driver operates like an automatic is $24,245. Other compact SUVs with only two-wheel drive can cost as much as a 2016 Forester with all-wheel drive. For example, the starting retail price for a two-wheel drive 2016 Nissan Rogue S compact SUV with a 170-horsepower engine and CVT is $24,190, and starting retail prices for 2016 CR-Vs and Kia Sportages with all-wheel drive are more than $25,300. Every Forester comes standard with rear vision camera, tilt and telescoping steering wheel and keyless remote entry. The test-driven 2016 Forester was pleasing and easy to drive, with controls that were logical and understandable. The low cowl of the dashboard made for particularly good views out the front of the vehicle, and passengers didn’t have a high climb up to get inside. There was a decent amount of height adjustment for the driver seat, plus up to 43 inches of legroom and 41.4 inches of headroom that made for comfortable seating for nearly any size of driver. The larger touchscreen — it was 7 inches in the test-driven model — made for quicker and easier adjustments to the navigation system and audio system than some controls that were in earlier Foresters. Wonderful sounds emanated from the premium and optional Harman/Kardon sound system, and for less than $32,000, the Forester Limited included leather-trimmed seats, power windows, door locks and outside mirrors, eight-way, power-adjustable driver seat, moonroof, automatic climate control and optional navigation system. Don’t miss Subaru’s optional EyeSight safety system, which alerts drivers if they start to wander out of the lane, sets specified distances for cruise control and includes fog lights that illuminate roads in curves and turns. But blind spot monitoring is missing. The new Subaru communications features for 2016 add more safety and security by notifying emergency personnel of a crash in which the Forester’s air bags deploy, providing 24/7 roadside assistance with the push of a button and helping an owner track a stolen vehicle. Other cars have offered these services for years. 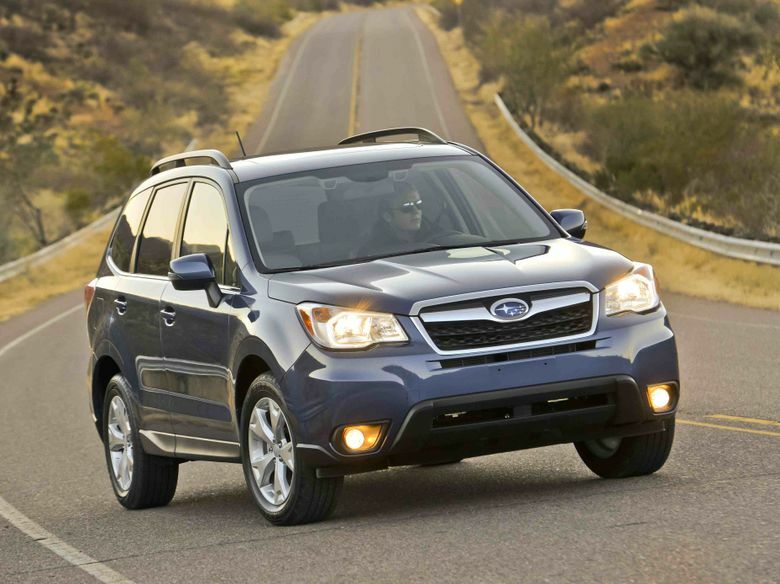 While the Forester rides well and handles capably, its CVT is designed for fuel economy, not sporty performance. The 170 horsepower is less than the 185 in the CR-V, and the Forester’s peak torque of 174 foot-pounds comes on at a high 4,100 rpm for decent mainstream power but not strong low-end oomph. The Forester delivers on fuel mileage, though, as the test vehicle averaged 26 mpg in city/highway travel, which amounted to more than 410 miles of travel range.